Product prices and availability are accurate as of 2019-03-30 16:28:46 EDT and are subject to change. Any price and availability information displayed on http://www.amazon.com/ at the time of purchase will apply to the purchase of this product. 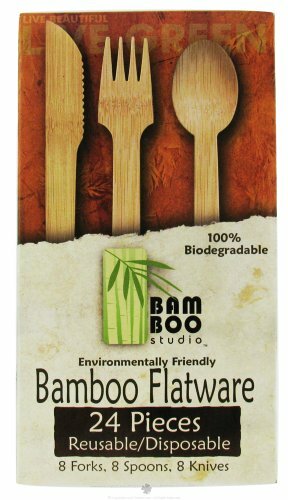 Bamboo Studio Disposable Utensils are unique, elegant and strong. They are perfect for picnics, parties, or throw them in your lunch. Made of 100% biodegradable bamboo. Disposable Bamboo Utensils 8 Sets of Forks, Spoons and Knives. Includes 8 disposable utensil sets Made out of bamboo No dyes are used to alter the color, the bamboo is as close to it's natural form as possible Microwave safe, disposable, may hand wash for extended uses (do not submerge in water), dry immediately after washing Take them anywhere!